Second-half goals from Adam Lallana and Alex Oxlade-Chamberlain secured Southampton's Carling Cup first round victory over Bournemouth. Former Bournemouth loanee Lallana opened the scoring with a sublime strike from 20 yards. Winger Oxlade-Chamberlain, 16, struck late on from 12 yards after latching on to Rickie Lambert's long ball. Brett Pitman went close for the Cherries either side of half-time while Marc Pugh hit Saints' crossbar. "We were a bit nervous from Saturday because we got beaten. "We've got to realise that every team that comes here will make us unsettled but we've still got enough quality to win games. "We're favourites... we've got a lot of work to do... We're playing at perhaps 95%. " "We were playing against a quality side, and a moment of magic won the game for them. "There were a lot of positives to take from the game, we looked solid at the back. "They paid us a lot of respect, they matched us up in the middle of the pitch... I think they had a tough game tonight." 90:00+2:37 Handball by Marc Pugh (Bournemouth). Indirect free kick taken right-footed by Kelvin Davis (Southampton) from own half, resulting in open play. 90:00+1:34 Cross by Jason Puncheon (Southampton), resulting in ball out of play. Defending throw-in by Stephen Purches (Bournemouth). 90:00+1:17 Defending throw-in by Danny Butterfield (Southampton). 90:00+1:04 Defending throw-in by Danny Butterfield (Southampton). 89:34 Foul by Lee Holmes (Southampton) on Brett Pitman (Bournemouth). Free kick crossed right-footed by Brett Pitman (Bournemouth) from right channel, resulting in ball out of play. Goal kick taken long by Kelvin Davis (Southampton). 88:53 Attacking throw-in by Liam Feeney (Bournemouth). 87:51 Attacking throw-in by Danny Butterfield (Southampton). 87:10 Goal kick taken long by Kelvin Davis (Southampton). 85:13 Assist (pass) by Richard Lambert (Southampton) from own half. 85:13 GOAL - Alex Oxlade-Chamberlain:Southampton 2 - 0 Bournemouth Goal by Alex Oxlade-Chamberlain (Southampton) right-footed (bottom-left of goal) from right side of penalty area (12 yards).Southampton 2-0 Bournemouth. 84:40 Defending throw-in by Stephen Purches (Bournemouth). 84:17 Attacking throw-in by Dan Harding (Southampton). 83:57 Shot by Richard Lambert (Southampton) left-footed from right side of penalty area (12 yards), save (parried) by Shwan Jalal (Bournemouth). 83:26 Attacking throw-in by Stephen Purches (Bournemouth). 83:09 Substitution Southampton substitution: Lee Barnard replaced by Richard Lambert (tactical). 82:04 Shot by Brett Pitman (Bournemouth) drilled left-footed from right channel (20 yards), save (parried) by Kelvin Davis (Southampton). 81:44 Attacking throw-in by Rhoys Wiggins (Bournemouth). 80:37 Inswinging corner from left by-line taken right-footed by Liam Feeney (Bournemouth) to centre, header by Danny Hollands (Bournemouth) from centre of penalty area (12 yards), missed right. Goal kick taken long by Kelvin Davis (Southampton). 79:32 Defending throw-in by Dan Harding (Southampton). 79:07 Goal kick taken long by Shwan Jalal (Bournemouth). 78:53 Defending throw-in by Dan Harding (Southampton). 78:26 Substitution Southampton substitution: Adam Lallana replaced by Lee Holmes (tactical). 77:48 Shot by Lee Barnard (Southampton) right-footed from right channel (20 yards), save (parried) by Shwan Jalal (Bournemouth). 77:03 Defending throw-in by Dan Harding (Southampton). 76:06 Foul by Jason Puncheon (Southampton) on Jason Pearce (Bournemouth). Direct free kick taken right-footed by Shwan Jalal (Bournemouth) from own half, resulting in open play. 75:36 Attacking throw-in by Marc Pugh (Bournemouth). 75:04 Attacking throw-in by Rhoys Wiggins (Bournemouth). 75:00 Defending throw-in by Rhoys Wiggins (Bournemouth). 74:09 Goal kick taken long by Kelvin Davis (Southampton). Correction - 74:09 Substitution Bournemouth substitution: Ryan Garry replaced by Lee Bradbury (tactical). 73:58 Goal kick taken long by Kelvin Davis (Southampton). 71:20 Inswinging corner from right by-line taken left-footed by Rhoys Wiggins (Bournemouth) to centre, foul by Brett Pitman (Bournemouth) on Kelvin Davis (Southampton). Direct free kick taken right-footed by Kelvin Davis (Southampton) from own half, resulting in open play. 71:04 Attacking throw-in by Liam Feeney (Bournemouth). 69:44 Foul by Ryan Garry (Bournemouth) on Lee Barnard (Southampton). Direct free kick taken left-footed by Dan Harding (Southampton) from left wing, shot by Adam Lallana (Southampton) curled left-footed from left channel (18 yards), missed right. Goal kick taken long by Shwan Jalal (Bournemouth). 68:40 Foul by Lee Barnard (Southampton) on Danny Hollands (Bournemouth). Indirect free kick taken left-footed by Shwan Jalal (Bournemouth) from own half, resulting in open play. 68:07 Michael Symes (Bournemouth) caught offside. Indirect free kick taken right-footed by Kelvin Davis (Southampton) from own half, resulting in open play. 67:30 Foul by Liam Feeney (Bournemouth) on Dan Harding (Southampton). Direct free kick taken right-footed by Kelvin Davis (Southampton) from own half, resulting in open play. 66:00 Foul by Danny Butterfield (Southampton) on Michael Symes (Bournemouth). Free kick drilled right-footed by Brett Pitman (Bournemouth) from left channel (25 yards), hit wall. 65:38 Shot by Jason Puncheon (Southampton) left-footed from right channel (25 yards), save (caught) by Shwan Jalal (Bournemouth). 64:56 Lee Barnard (Southampton) caught offside. Indirect free kick taken left-footed by Shwan Jalal (Bournemouth) from own half, resulting in open play. 64:56 Substitution Bournemouth substitution: Marvin Bartley replaced by Michael Symes (tactical). 62:59 Assist (pass) by Jason Puncheon (Southampton) from left channel. 62:59 GOAL - Adam Lallana:Southampton 1 - 0 Bournemouth Goal by Adam Lallana (Southampton) drilled right-footed (bottom-right of goal) from left channel (20 yards).Southampton 1-0 Bournemouth. 62:21 Cross by Liam Feeney (Bournemouth), resulting in ball out of play. Goal kick taken long by Kelvin Davis (Southampton). 61:41 Inswinging corner from left by-line taken right-footed by Marc Pugh (Bournemouth) to centre, clearance by Dan Harding (Southampton). 60:51 Attacking throw-in by Dan Harding (Southampton). 60:24 Defending throw-in by Danny Butterfield (Southampton). 59:42 Cross by Marc Pugh (Bournemouth), save (caught) by Kelvin Davis (Southampton). 59:14 Attacking throw-in by Marc Pugh (Bournemouth). 58:44 Foul by Lee Barnard (Southampton) on Jason Pearce (Bournemouth). Direct free kick taken left-footed by Jason Pearce (Bournemouth) from own half, resulting in open play. 56:43 Goal kick taken long by Shwan Jalal (Bournemouth). 56:43 Substitution Bournemouth substitution: Shaun Cooper replaced by Danny Hollands (tactical). 56:43 Shot by Lee Barnard (Southampton) lobbed right-footed from centre of penalty area (6 yards), over the bar. 55:58 Cross by Jason Puncheon (Southampton), clearance by Rhoys Wiggins (Bournemouth). Inswinging corner from right by-line taken left-footed by Jason Puncheon (Southampton) to centre, header by Danny Butterfield (Southampton) from centre of penalty area (12 yards), clearance by Stephen Purches (Bournemouth). 55:24 Attacking throw-in by Stephen Purches (Bournemouth). 54:53 Attacking throw-in by Stephen Purches (Bournemouth). Correction - 53:57 Foul by Lee Barnard (Southampton) on Jason Pearce (Bournemouth). Free kick crossed left-footed by Rhoys Wiggins (Bournemouth) from left wing, save (punched) by Kelvin Davis (Southampton). 53:57 Foul by Lee Barnard (Southampton) on Jason Pearce (Bournemouth). Direct free kick taken left-footed by Rhoys Wiggins (Bournemouth) from left wing, resulting in open play. 53:17 Attacking throw-in by Rhoys Wiggins (Bournemouth). 52:14 Cross by Dan Harding (Southampton), resulting in ball out of play. Goal kick taken long by Shwan Jalal (Bournemouth). 51:51 Attacking throw-in by Dan Harding (Southampton). 51:04 Cross by Danny Butterfield (Southampton), resulting in ball out of play. Goal kick taken long by Shwan Jalal (Bournemouth). 50:50 Attacking throw-in by Danny Butterfield (Southampton). 50:12 Attacking throw-in by Danny Butterfield (Southampton). 49:30 Cross by Liam Feeney (Bournemouth), resulting in ball out of play. Defending throw-in by Danny Butterfield (Southampton). 48:11 Inswinging corner from right by-line taken left-footed by Jason Puncheon (Southampton) to near post, header by Dean Hammond (Southampton) from right side of penalty area (12 yards), over the bar. Goal kick taken long by Shwan Jalal (Bournemouth). 48:00 Cross by Dan Harding (Southampton), clearance by Marvin Bartley (Bournemouth). 46:59 Defending throw-in by Stephen Purches (Bournemouth). 46:14 Defending throw-in by Dan Harding (Southampton). 45:14 Defending throw-in by Dan Harding (Southampton). 45:01 Substitution Southampton substitution: Ryan Dickson replaced by Dan Harding (tactical). 45:00+0:42 Marvin Bartley (Bournemouth) caught offside. Indirect free kick taken right-footed by Kelvin Davis (Southampton) from own half, resulting in open play. 45:00+0:31 Cross by Rhoys Wiggins (Bournemouth), resulting in open play. 45:00+0:11 Attacking throw-in by Stephen Purches (Bournemouth). 44:49 Cross by Marc Pugh (Bournemouth), resulting in open play. 44:01 Inswinging corner from right by-line taken left-footed by Jason Puncheon (Southampton) to centre, save (punched) by Shwan Jalal (Bournemouth). 43:32 Attacking throw-in by Danny Butterfield (Southampton). 42:49 Shot by Alex Oxlade-Chamberlain (Southampton) left-footed from left channel (25 yards), save (parried) by Shwan Jalal (Bournemouth). Inswinging corner from right by-line taken left-footed by Jason Puncheon (Southampton) to centre, clearance by Rhoys Wiggins (Bournemouth). 40:47 Attacking throw-in by Stephen Purches (Bournemouth). 38:12 Cross by Jason Puncheon (Southampton), save (caught) by Shwan Jalal (Bournemouth). 37:25 Shot by Brett Pitman (Bournemouth) drilled right-footed from right side of penalty area (12 yards), missed left. Goal kick taken long by Kelvin Davis (Southampton). 37:11 Defending throw-in by Ryan Dickson (Southampton). 34:56 Foul by Jason Puncheon (Southampton) on Marc Pugh (Bournemouth). Free kick taken right-footed by Brett Pitman (Bournemouth) curled from left channel (20 yards), over the bar. Inswinging corner from right by-line taken left-footed by Rhoys Wiggins (Bournemouth) to centre, save (caught) by Kelvin Davis (Southampton). 34:11 Inswinging corner from right by-line taken left-footed by Rhoys Wiggins (Bournemouth) to centre, clearance by Jose Fonte (Southampton). 33:21 Defending throw-in by Stephen Purches (Bournemouth). 32:14 Inswinging corner from right by-line taken left-footed by Rhoys Wiggins (Bournemouth) to near post, clearance by Dean Hammond (Southampton). 31:28 Attacking throw-in by Stephen Purches (Bournemouth). 29:28 Direct free kick taken left-footed by Shwan Jalal (Bournemouth) from own half, passed. 29:28 Booking Dean Hammond (Southampton) booked for unsporting behaviour. 29:28 Foul by Dean Hammond (Southampton) on Marvin Bartley (Bournemouth). 28:54 Attacking throw-in by Adam Lallana (Southampton). 28:06 Foul by Ryan Garry (Bournemouth) on Lee Barnard (Southampton). Free kick crossed right-footed by Adam Lallana (Southampton) from left wing, clearance by Brett Pitman (Bournemouth). 26:34 Goal kick taken long by Shwan Jalal (Bournemouth). 26:03 Foul by Jason Pearce (Bournemouth) on Lee Barnard (Southampton). Direct free kick taken left-footed by Jason Puncheon (Southampton) from right wing, passed. 25:23 Defending throw-in by Stephen Purches (Bournemouth). 25:02 Attacking throw-in by Danny Butterfield (Southampton). 24:38 Attacking throw-in by Danny Butterfield (Southampton). 23:36 Foul by Dean Hammond (Southampton) on Anton Robinson (Bournemouth). Direct free kick taken left-footed by Shwan Jalal (Bournemouth) from own half, resulting in open play. 22:37 Goal kick taken long by Shwan Jalal (Bournemouth). 21:49 Cross by Brett Pitman (Bournemouth), header by Liam Feeney (Bournemouth) from centre of penalty area (12 yards), over the bar. Goal kick taken long by Kelvin Davis (Southampton). 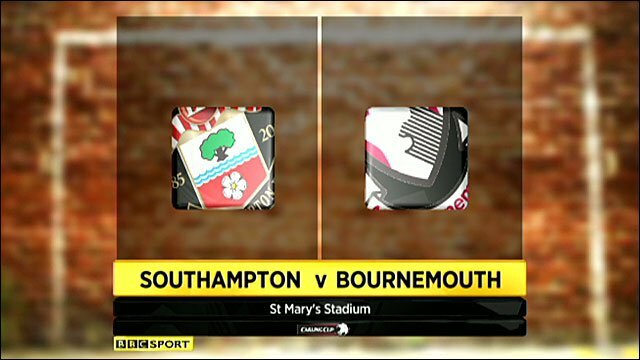 21:21 Foul by Adam Lallana (Southampton) on Marvin Bartley (Bournemouth). Direct free kick taken left-footed by Shwan Jalal (Bournemouth) from own half, resulting in open play. 21:10 Cross by Danny Butterfield (Southampton), clearance by Ryan Garry (Bournemouth). 19:27 Inswinging corner from left by-line taken right-footed by Marc Pugh (Bournemouth) to centre, clearance by Daniel Seaborne (Southampton). 18:56 Attacking throw-in by Rhoys Wiggins (Bournemouth). 18:05 Shot by Liam Feeney (Bournemouth) left-footed from right channel (25 yards), missed right. Goal kick taken long by Kelvin Davis (Southampton). 17:40 Attacking throw-in by Rhoys Wiggins (Bournemouth). 17:00 Defending throw-in by Stephen Purches (Bournemouth). 16:34 Defending throw-in by Ryan Dickson (Southampton). 15:26 Goal kick taken long by Kelvin Davis (Southampton). 14:34 Cross by Ryan Dickson (Southampton), save (caught) by Shwan Jalal (Bournemouth). 14:01 Defending throw-in by Rhoys Wiggins (Bournemouth). 12:42 Jason Puncheon (Southampton) caught offside. Indirect free kick taken left-footed by Jason Pearce (Bournemouth) from own half, passed. 11:50 Defending throw-in by Stephen Purches (Bournemouth). 11:22 Shot by Jason Puncheon (Southampton) drilled left-footed from right channel (20 yards), save (parried) by Shwan Jalal (Bournemouth). 10:51 Goal kick taken long by Kelvin Davis (Southampton). 10:40 Attacking throw-in by Stephen Purches (Bournemouth). 9:50 Lee Barnard (Southampton) caught offside. Indirect free kick taken left-footed by Shwan Jalal (Bournemouth) from own half, resulting in open play. 9:21 Cross by Ryan Dickson (Southampton), clearance by Shaun Cooper (Bournemouth). 8:46 Defending throw-in by Danny Butterfield (Southampton). 7:36 Cross by Lee Barnard (Southampton), clearance by Rhoys Wiggins (Bournemouth). Inswinging corner from right by-line taken left-footed by Jason Puncheon (Southampton) to far post, clearance by Stephen Purches (Bournemouth). Inswinging corner from left by-line taken right-footed by Adam Lallana (Southampton) to centre, clearance by Anton Robinson (Bournemouth). 6:59 Attacking throw-in by Danny Butterfield (Southampton). 6:30 Defending throw-in by Rhoys Wiggins (Bournemouth). 5:32 Inswinging corner from left by-line taken right-footed by Adam Lallana (Southampton) to centre, clearance by Rhoys Wiggins (Bournemouth). 5:08 Attacking throw-in by Danny Butterfield (Southampton). 4:29 Goal kick taken long by Shwan Jalal (Bournemouth). 3:39 Foul by Dean Hammond (Southampton) on Brett Pitman (Bournemouth). Direct free kick taken left-footed by Rhoys Wiggins (Bournemouth) from own half, resulting in open play. 3:17 Defending throw-in by Rhoys Wiggins (Bournemouth). 2:31 Inswinging corner from left by-line taken right-footed by Adam Lallana (Southampton) to centre, save (punched) by Shwan Jalal (Bournemouth). 1:54 Foul by Marvin Bartley (Bournemouth) on Alex Oxlade-Chamberlain (Southampton). Direct free kick taken right-footed by Danny Butterfield (Southampton) from right channel, resulting in open play. 1:28 Defending throw-in by Stephen Purches (Bournemouth). 0:29 Defending throw-in by Stephen Purches (Bournemouth). 0:06 Defending throw-in by Danny Butterfield (Southampton). The referee gets the second half underway.